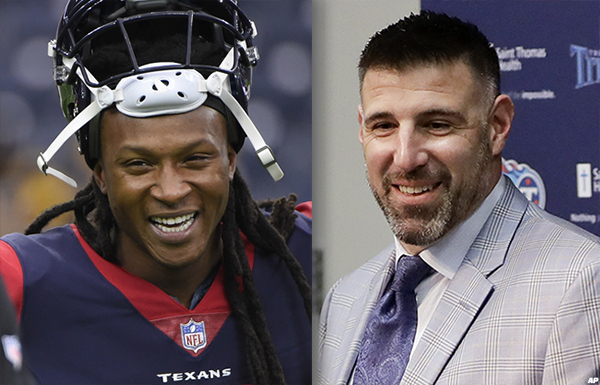 Texans receiver DeAndre Hopkins spent the past four years with new Titans head coach Mike Vrabel in Houston. Hopkins had some nice things to say about Vrabel over the weekend at NFL Honors from Super Bowl LII. NASHVILLE, Tenn. – Texans receiver DeAndre Hopkins has spent the past five seasons terrorizing NFL defenses, including his own in practices. During that time, he developed a great deal of respect for Mike Vrabel, who spent four seasons in Houston before being hired as head coach of the Tennessee Titans last month. Hopkins, speaking on the red carpet of the NFL Honors at Super Bowl LII over the weekend in Minneapolis, said he was sorry to see Vrabel go. Despite competing on opposite sides of the football in Houston, Hopkins said he got to know Vrabel well. And Hopkins believes Vrabel’s ability to connect with players should help him as a head coach. “I had a lot of interaction with him,” Hopkins said. “He’s one of those guys you could talk to off the field, not just about football, but personal stuff. Vrabel was good to me. It wasn’t just a football relationship with him, it was a personal relationship. Guys could relate to him. A two-time Pro Bowler who has already amassed 5,865 receiving yards in his career, Hopkins joined the Texans in 2013. A year later, Vrabel joined the Texans as linebackers coach, a job he held from 2014-2016 before being promoted to defensive coordinator in 2017. Last month, Vrabel was hired by the Titans. Hopkins believes the Titans are going to be a threat once again in the division. The Titans finished 9-7 last season, and in second place behind the Jaguars. The Texans and Colts finished at 4-12. Hopkins believes Vrabel will have a solid staff around him in Tennessee, and he believes he’ll develop trust with players on both sides of the ball. The Titans hired former Rams offensive coordinator Matt LaFleur as their offensive coordinator, and hired former Ravens defensive coordinator Dean Pees to lead the defense. The fact Vrabel’s a defensive-minded coach doesn’t mean his offenses can’t be successful, Hopkins said. “I would definitely disagree with that,” he said. “Vrabel knows football, and he is definitely going to use Marcus Mariota and take advantage of his skill set. He’ll also work with him on what thinks he is not good at, and help him improve. That is one thing about Vrabel – he is honest, and he is going to push you to be the best you can be.